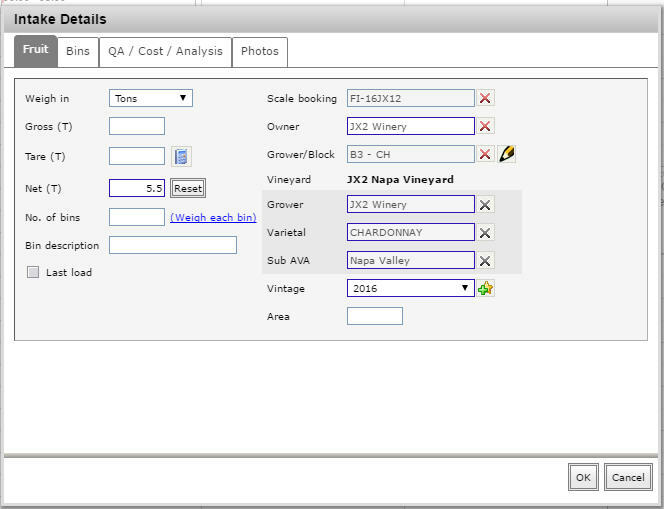 The Harvest calendar is only available in vintrace Professional and Enterprise. 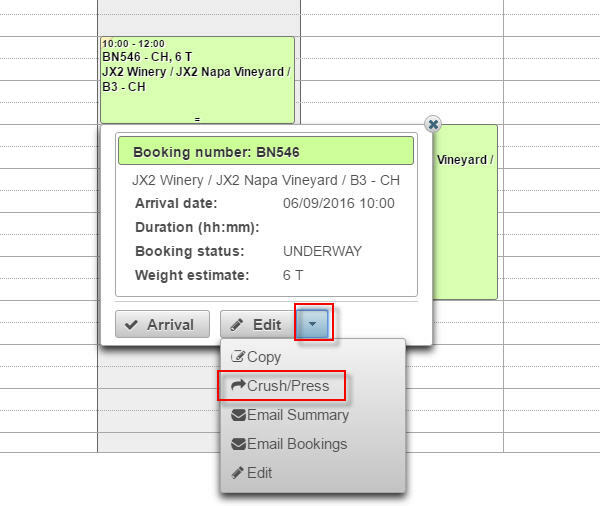 You an create,edit, copy, email fruit bookings and prepare a crush note from the harvest calendar. This article is more of a general guide on managing fruit intakes from the harvest calendar. For more details about managing fruit intake bookings/reservations in general, please click here. To create a fruit booking, click on a date/time on the harvest calendar. In the example below, we clicked on 9th of June, 10am. 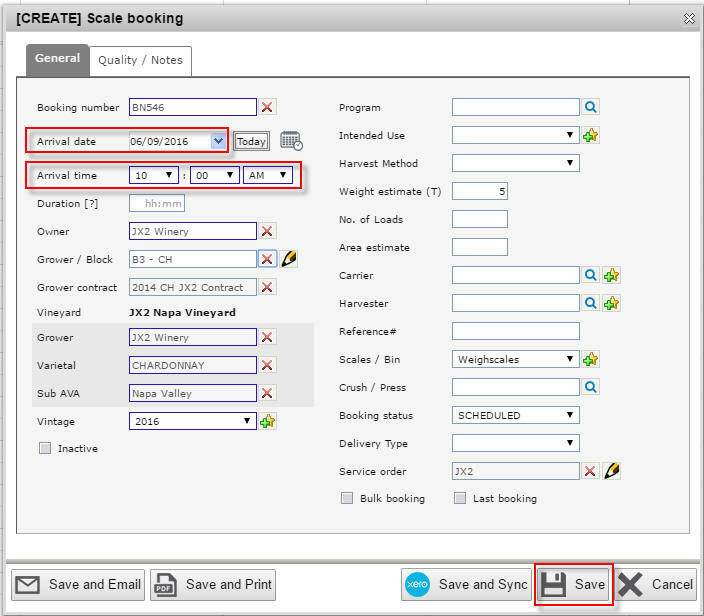 The [Create] Scale booking screen will be displayed with the selected date and time from the harvest calendar copied into the Arrival date and Arrival time fields. Enter required details for the booking then click on Save button. The new fruit booking is displayed in the harvest calendar. Click on the fruit booking you want to edit and then click on the Edit button on the dialog that comes up. Make the changes you want for the fruit booking. In this example, we updated the weight estimate for the booking. Click on the Save button. 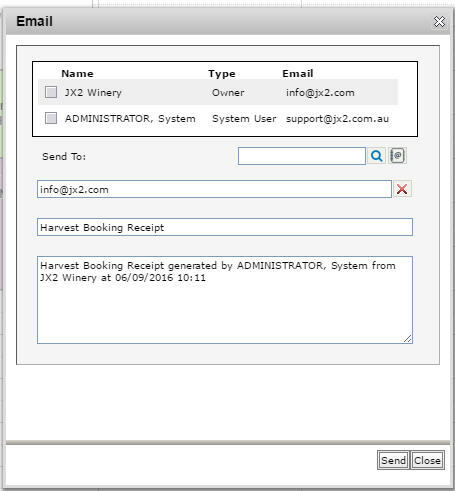 The harvest calendar also supports drag and drop to allow you to change start times for fruit bookings. You can also resize an entry in the calendar to change the expected duration (very similar to other calendar tools, like Google calendar). Please read this article for more details. Click on the fruit booking where you want to receive the fruit and then click on the Arrival button on the dialog that comes up. Enter the necessary intake details and click on the OK button. After the intake delivery details have been entered, the colour of the fruit booking in the harvest calendar changes to light green. Please refer here for the meaning of the different colours. You can prepare a crush note for a booking by clicking on the booking, click on the dropdown button beside Edit button and click on Crush/Press. 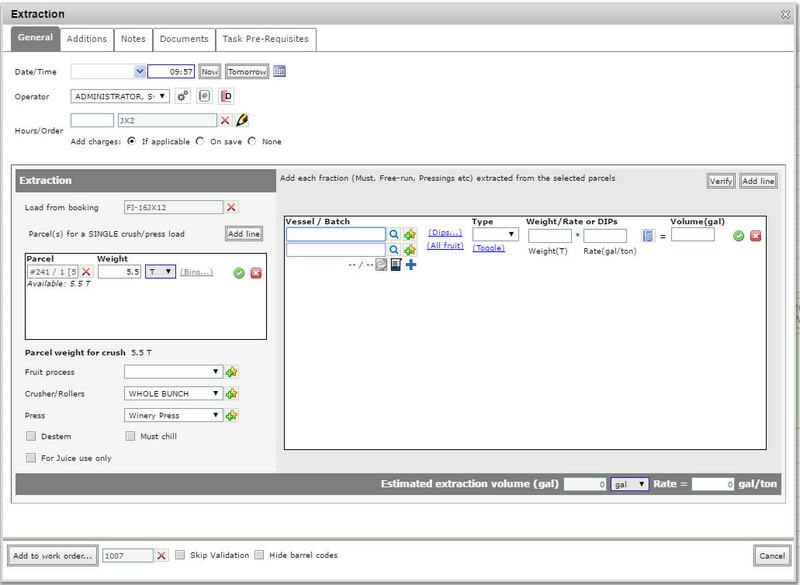 The extraction screen will be displayed and populated with the selected booking. 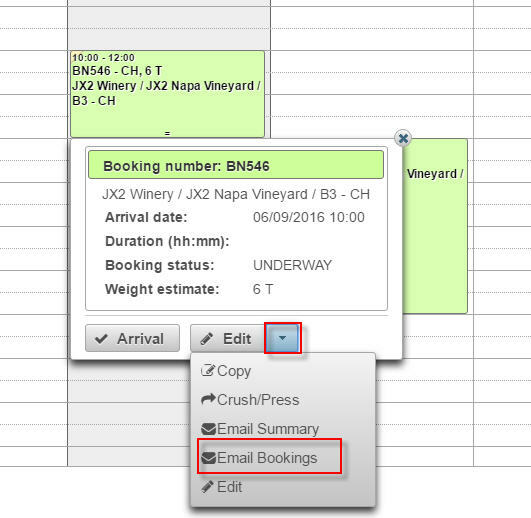 You can email a booking by clicking on the booking, click on the dropdown button beside Edit button and click on Email Bookings. The email dialog will be displayed. Enter the necessary details and click on Send button. 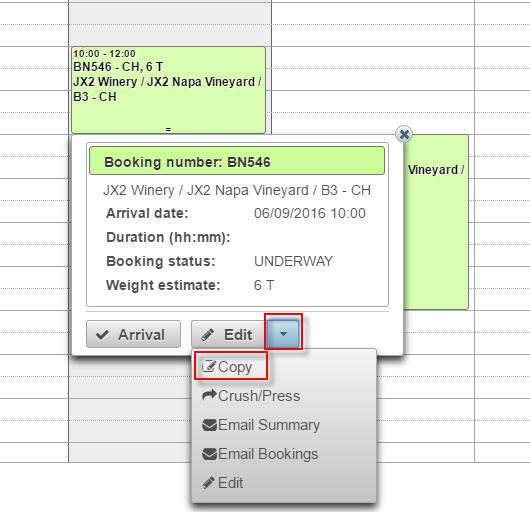 You can create a new booking by copying an existing one. 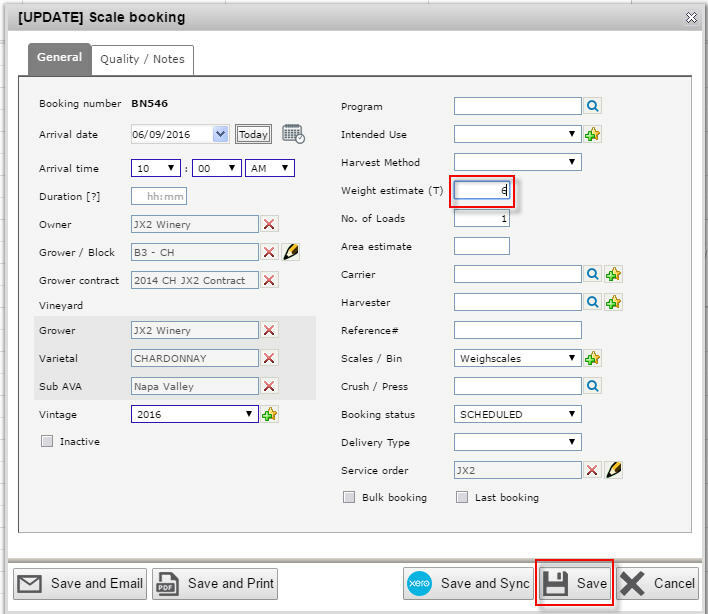 Click on the booking you want to copy, click on the dropdown button beside Edit and then click on Copy. 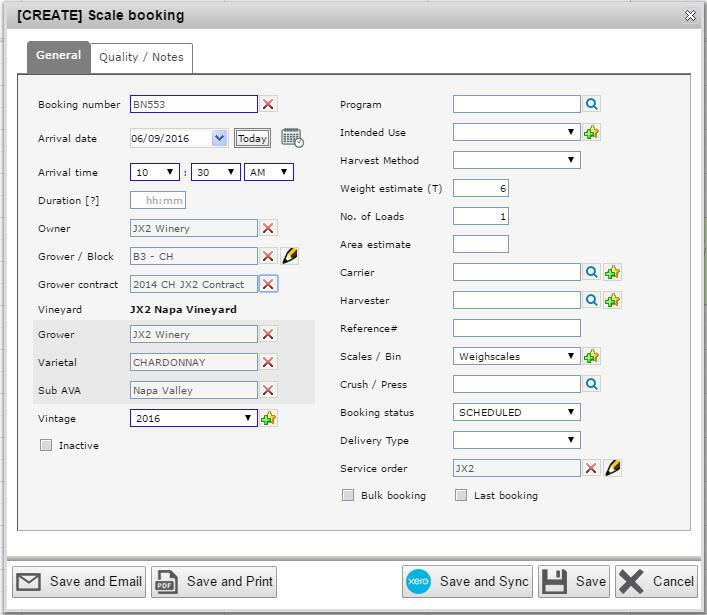 The [Create] Scale booking screen is displayed with all the booking details copied from the existing booking.